(Refer back to the Advanced Data Visualization lesson). Raise or lower their expression in response to growth rate. Growth-rate dependent expression patterns can tell us a lot about cell cycle control, and how the cell responds to stress. The authors found that expression of >25% of all yeast genes is linearly correlated with growth rate, independent of the limiting nutrient. They also found that the subset of negatively growth-correlated genes is enriched for peroxisomal functions, and positively correlated genes mainly encode ribosomal functions. Respond differently when different nutrients are being limited. If you see particular genes that respond very differently when a nutrient is sharply restricted, these genes might be involved in the transport or metabolism of that specific nutrient. You can download the cleaned up version of the data at the link above. The file is called brauer2007_tidy.csv. 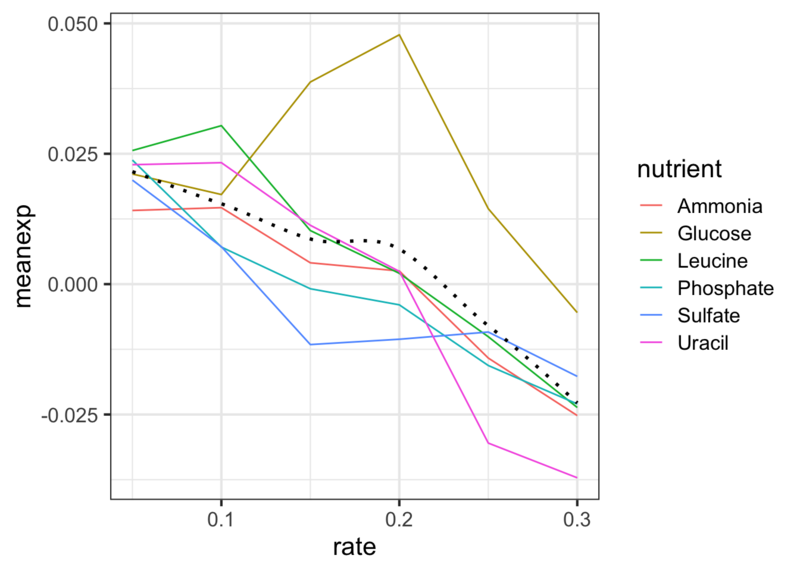 Load the ggplot2, dplyr, readr packages, and read the tidy Brauer data into R using the read_csv() function (note, not read.csv()). Assign the data to an object called ydat. Note, the code is available by hitting the “Code” button above each expected output, but try not to use it unless you’re stuck. Follow the prompts and use ggplot2 to reproduce the plots below. We can start by taking a look at the distribution of the expression values. 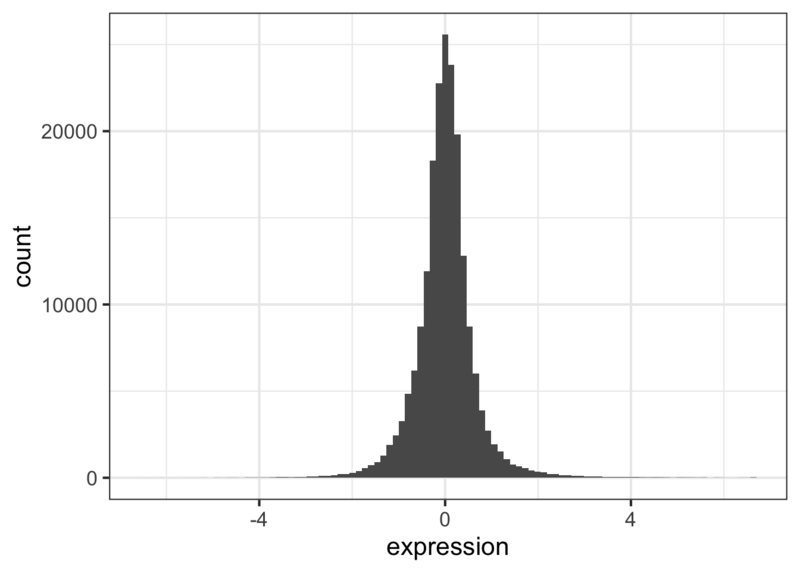 Plot a histogram of the expression variable, and set the bin number equal to 100. 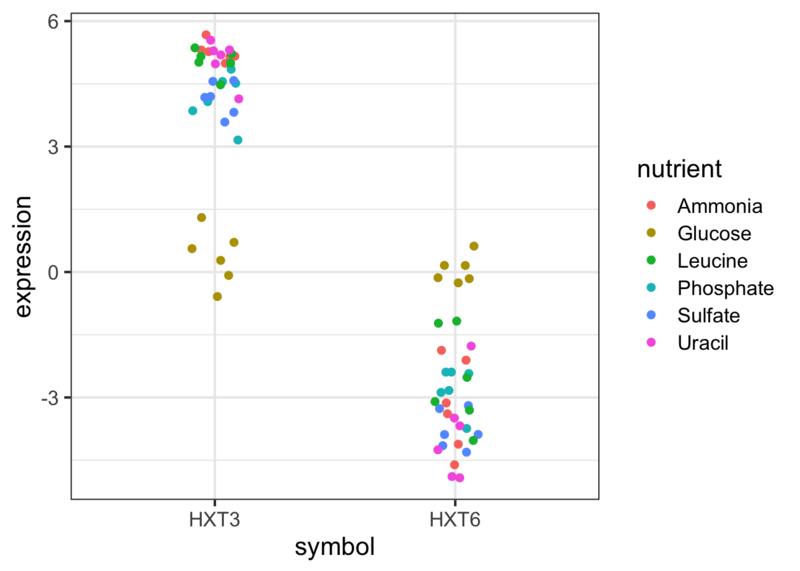 Check the distribution of each nutrient in the data set by adjusting the fill aesthetic. Use the same bin number for this histogram. Wow. That’s ugly. Might be a candidate for accidental aRt but not very helpful for our analysis. Now split off the same histogram into a faceted display with 3 columns. The basic exploratory process above confirms that the overall distribution (as well each distribution by nutrient) is normal. 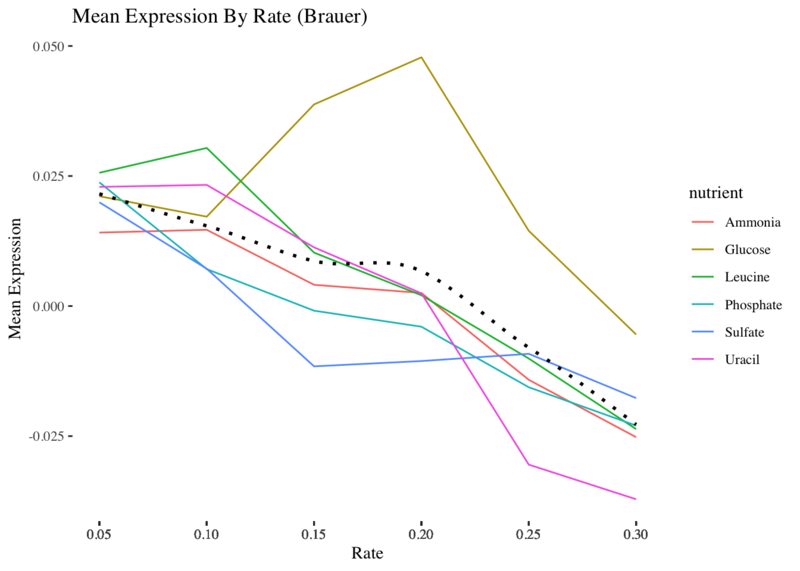 Let’s compare the genes with the highest and lowest average expression values. Then filter for the first or last row. The output tells us that the gene with the highest mean expression is HXT3, while the gene with the lowest mean expression is HXT6. 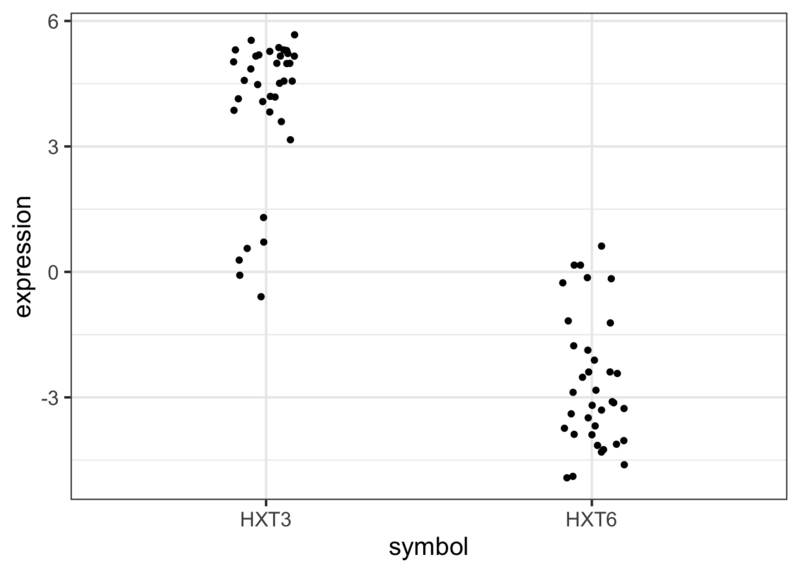 Subset the data to only include these genes, and create a stripplot that has expression values as “jittered” points on the y-axis and the gene symbols the x-axis. Now map each observation to its nutrient by color and adjust the size of the points to be 2. 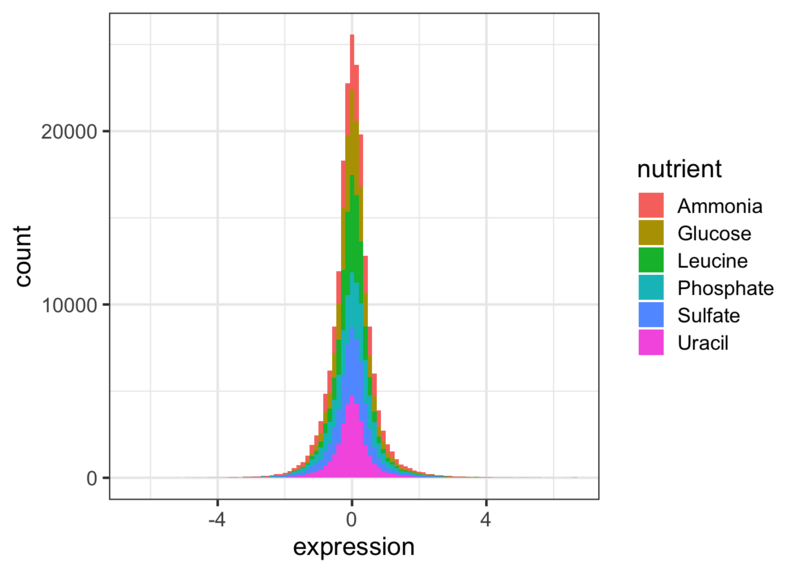 Although these two genes are on opposite ends of the distribution of average expression values, they both seem to express similar amounts when Glucose is the restricted nutrient. Now let’s try to make something that has a little bit more of a polished look. 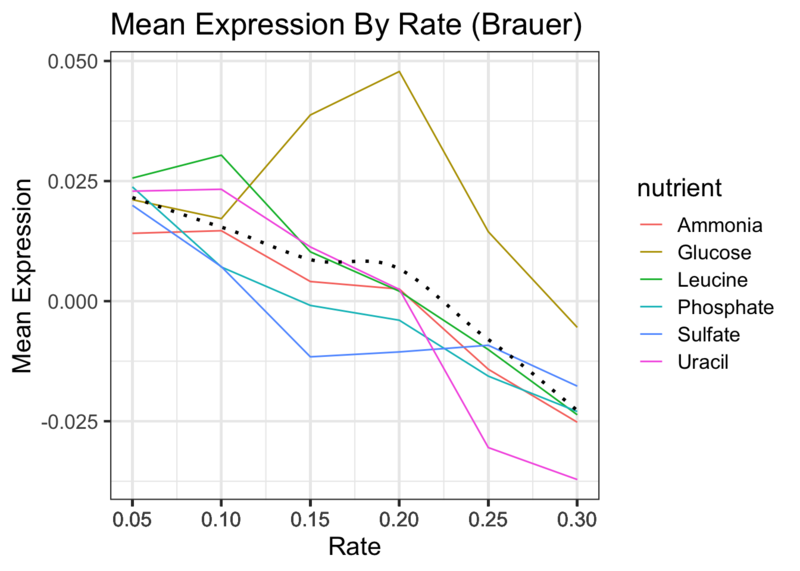 Using dplyr logic, create a data frame that has the mean expression values for all combinations of rate and nutrient (hint: use group_by() and summarize()). 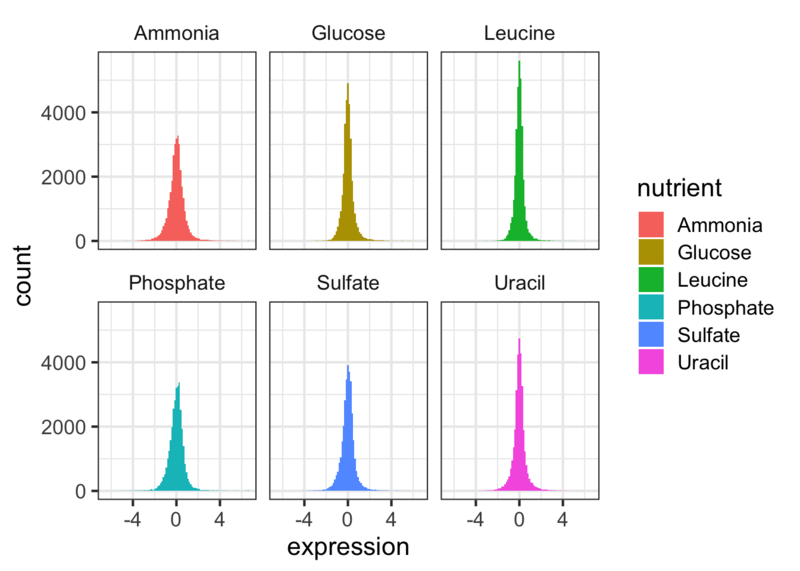 Create a plot of this data with rate on the x-axis and mean expression on the y-axis and lines colored by nutrient. 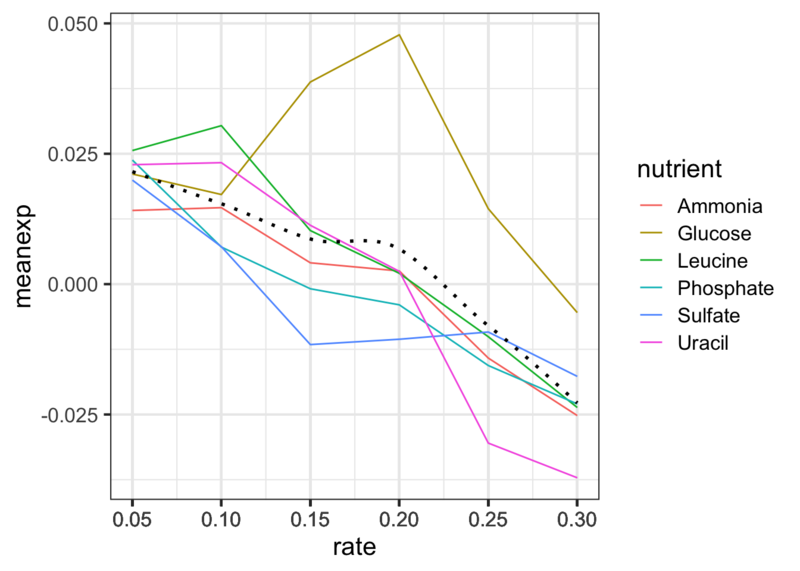 Add black dotted line (lty=3) that represents the smoothed mean of expression across all combinations of nutrients and rates. Change the scale to include breaks for all of the rates. HINT The read_csv() function read in the rate variable as continuous rather than discrete. There are a few ways to remedy this, but first see if you can set the scale for the x axis variable without changing the dataframe. 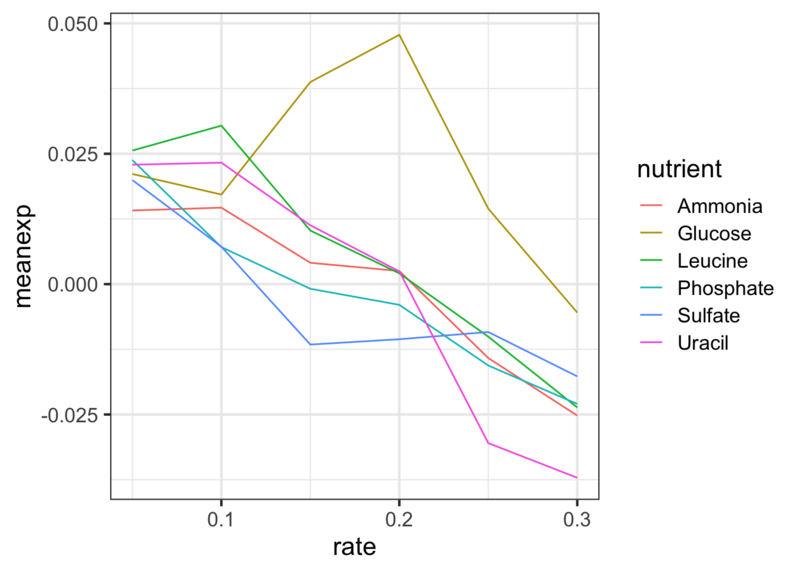 HINT ?labs will pull up the ggplot2 documentation on axes labels and plot titles. Add a theme from the ggthemes package. The plot below is based on Edward Tufte’s book The Visual Display of Quantitative Information. Choose a theme that you like, but choose wisely – some of these themes will override other adjustments you’ve made to your plot above, including axis labels. HINT 1: library(ggthemes) not working for you? Install the package first. The last step is to save the plot you’ve created. Write your plot to a 10 X 6 PDF using a ggplot2 function. This work is licensed under the CC BY-NC-SA 4.0 Creative Commons License.